Musica the blacksmith forged two legendary swords long ago. 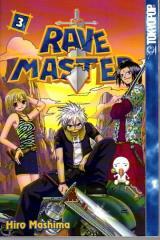 One is the Ten Powers, the transforming sword of the Rave Master. The other is the Beast Sword, a blade which creates illusions when it is swung. After being apart for a generation, the swords are about to have a bloody reunion. Haru Glory, the Rave Master, now wields the Ten Powers, and he’ll need it to rescue his friend Elie from Demon Card. She’s being held hostage by Lance, the Beast Swordsman, who has a little surprise in store for young Haru – through the power of Dark Bring, source of all evil, his Beast Sword’s illusions can now become real! But Haru has a secret weapon of his own – the power of Rave!